One of my friends, Fred Grill, who was a flight mechanic on Sikorsky HH-53’s during the Vietnam war sent me these pictures. Due to the historic markings on this aircraft I though the club would be interested in these pictures. 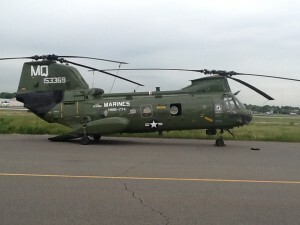 This aircraft is one of four operational CH-46’s remaining in USMC service and was involved in the American evacuation of Vietnam in 1975. Active duty Marines have restored the aircraft to almost pristine condition. In July the aircraft will be retired and displayed at the Marine museum in Quantico Virginia with final disposition at the National Air and Space Museum in Washington DC. These pictures were taken in May at Teterboro Airport in New Jersey while the aircraft was supporting Fleet Week operations. This entry was posted in Uncategorized by New Jersey IPMS. Bookmark the permalink.